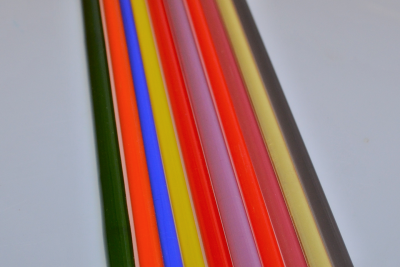 A collection of Reichenbach glass rods, 10 rods in total. The collection includes Mystic Red , Mystic Orange , Mystic Coral , Mystic Green , Mystic Blue , Mystic Pink , Mystic Yellow , Mystic Beige , Mystic Violet and Mystic Grey/Blue. All the rods are individually labled and are 104coe.